Visual was the 5th largest manufacturer of office graphics terminals. They once thought they could design a nice IBM PC clone (which they did) and sell it with their terminals (which they didn't). It turned out that Visual's salesmen weren't equipped to sell computers and Visual had put too much money into these computers (the built-in color graphics, a terminal mode, 2 disk drives, etc.) to sell them at stripped down prices. So Visual sold them all to DAK (a popular US electronic reseller) and took an enormous loss. The Visual 1083, also known as the "Commuter" is an interesting machine. It is an early MS-DOS system, thus considered as IBM PC compatible. 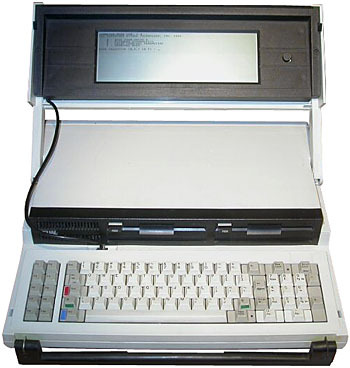 It could even be the first "IBM PC" portable computer equiped with a LCD display ! Indeed the particularity of the Commuter is to be able to a use detachable (and optional) LCD display (80x16 characters, monochrome) or a more classic RGB monitor (80x25 characters). The LCD display can flip up and down to make the system portable. Thanks to its big sturdy handle, the "Commuter" can thus be easily carried away. The case being completely closed, the computer turns into a practical suitcase (see "more pictures" page). Built-in the system are two 5.25" disk drives offering 360 KB each. The 83 key keyboard is identical to IBM's PC, except for the addition of lights on the "Caps Lock" and "Num Lock" keys. The computer could be expanded by adding custom cards. There is an expansion port that can be directly connected to an IBM expansion chassis. I was executive VP of Custom Computer Systems located in Marlboro MA. The Commuter was actually designed by our team of engineers...led by Prevez Zaki. We got the product to the prototype stage and realized we didn't have the capital necessary to mass produce the product. Therefore we sold our company to Visual Technologies in a $10M stock transaction. BUILT IN MEDIA Two 360 KB 5.25'' FDD. see more Visual Technology Visual 1083 / Commuter Ebay auctions !